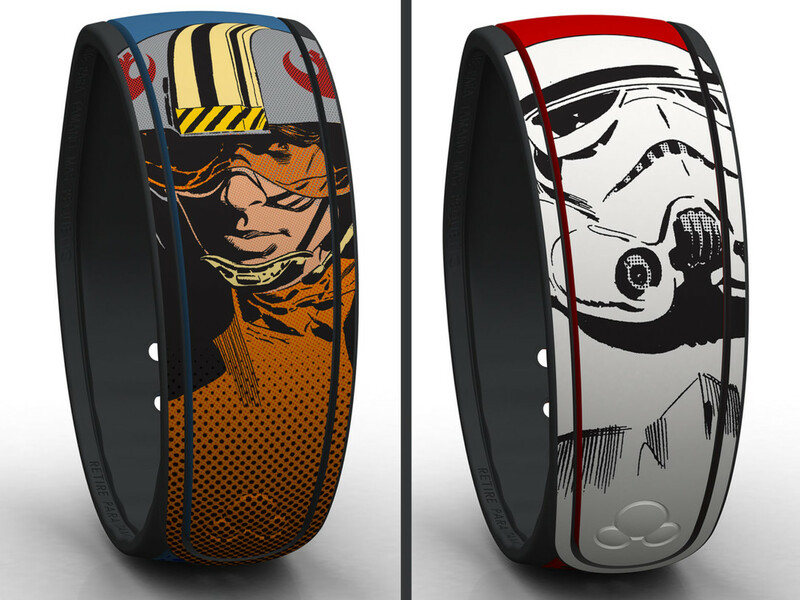 I recently shared with you a first look at new merchandise coming to Star Wars Weekends 2014 at Disney’s Hollywood Studios beginning May 16. 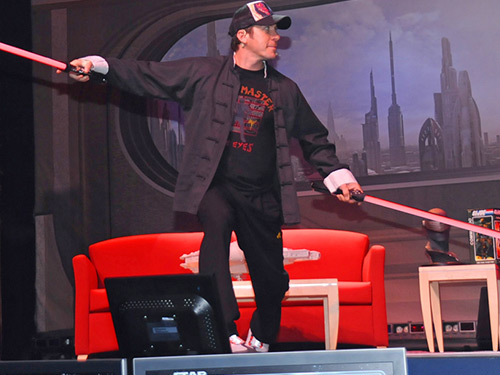 Today, I’m thrilled to announce that the Star Wars – D-Tech Me experience will return this year with a few new options for guests. This year, the experience will be located inside Darth’s Mall, located in Soundstage 1 between Studio Backlot Tour and Toy Story Midway Mania. For those unfamiliar with Star Wars – D-Tech Me, this 10-minute experience uses the world’s highest-resolution, single-shot 3D face scanner created by our Imagineering scientists with Disney Research labs. The captured image is later sent to a high resolution 3D printer to create the figure. My fellow author Gary Buchanan has a cool, behind-the-scenes video about the experience as seen in this story. This year features two returning favorites — Carbon-Freeze Me, Stormtrooper — along with female options offered for X-wing pilot, Carbon-Freeze Me, and Stormtrooper figures. 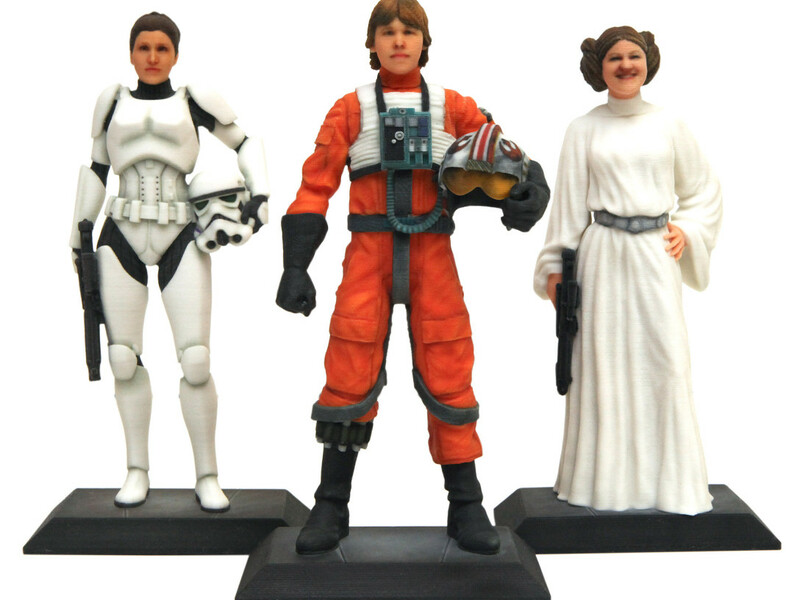 For children, Alderaan Princess and Carbon-Freeze Me figures will be available in more youthful appearances. For the first time, we are introducing a 16-inch figure. 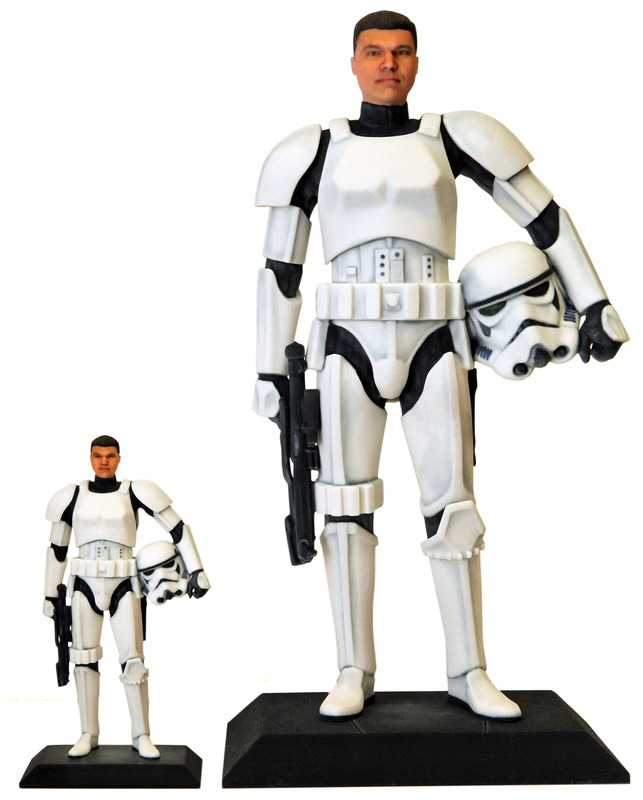 While a wise Jedi Master once said “size matters not,” you can see the size differences of the Stormtrooper figures in the above image. Additionally, we will share details starting May 16 on DisneyParksMerchandise.com about how you can have your image from last year added to a new figure this year. 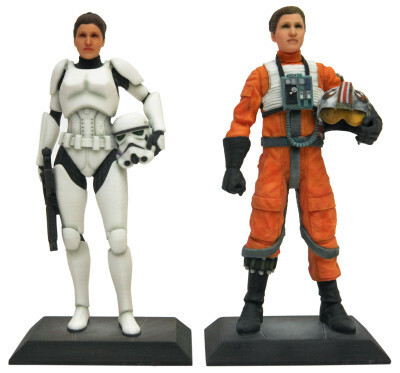 An example of this is shown above with a Stormtrooper figure image from last year applied to the new X-wing Pilot figure. The Star Wars – D-Tech Me 7-inch figures are $99.95 each, plus shipping and applicable sales tax. For the 16-inch figures, retail is $1,499.95 each, plus shipping and applicable sales tax. All participants will receive a specially designed button. Completed figures will arrive within 7-8 weeks after the experience if shipping domestically (it takes a little longer if shipping internationally). To book your experience, please call 407-WDW-TECH (407-939-8324). 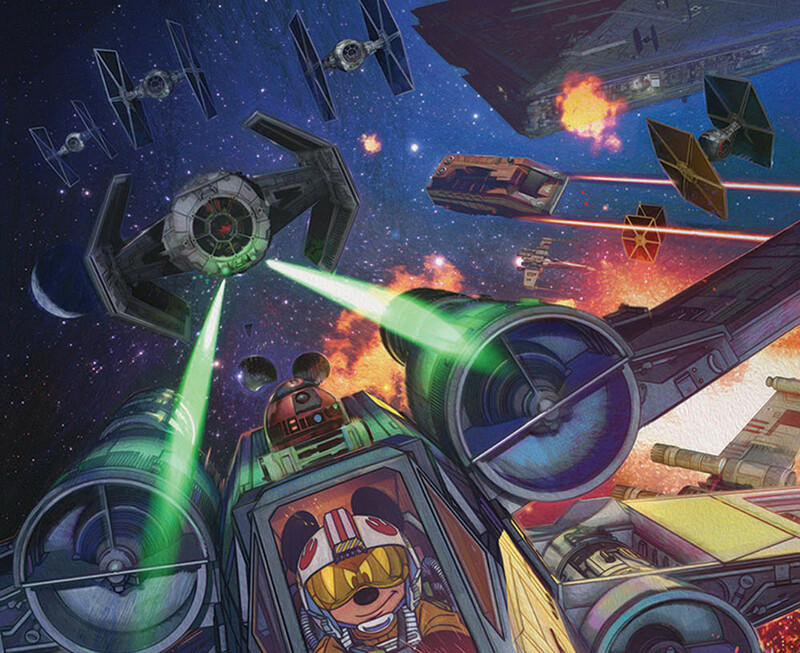 We will only offer the experience during Star Wars Weekends 2014 (May 16 – 18, May 23 – 25, May 30 – June 1, June 6 – 8, and June 13-15). 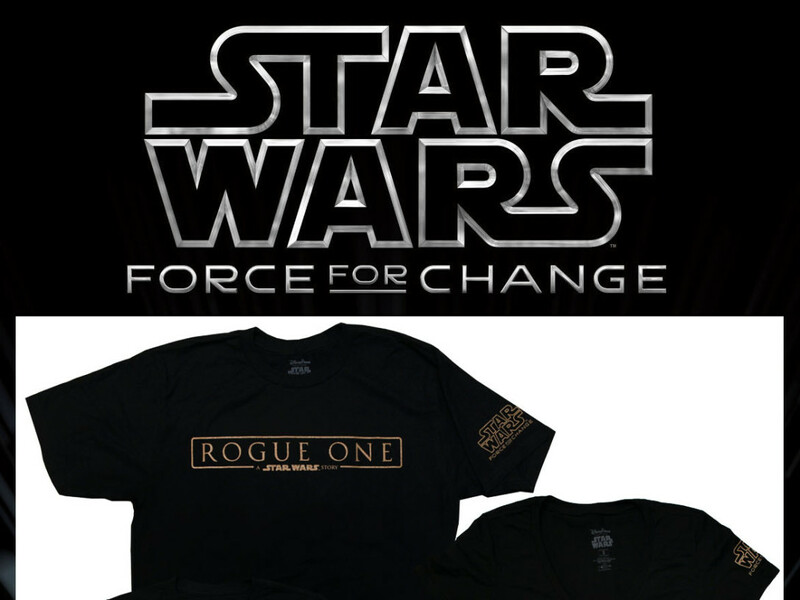 Finally, guests attending the Rebel Rendezvous event on May 15 will be some of the first individuals to experience Star Wars – D-Tech Me this year. Registered event guests should look for an e-mail soon that will explain how to sign up. If you still want to go to the Rebel Rendezvous event, we’d love to have you! Please see DisneyParksMerchandise.com for more details.